Portals to other portals, aggregated contacts, filters, integration of platforms, convergence, things speaking to each other. Here is one interesting example of an online filter/ place for finding social action websites such as microfinancing success kiva.org. Imdoingmypart.org is run by social actions. 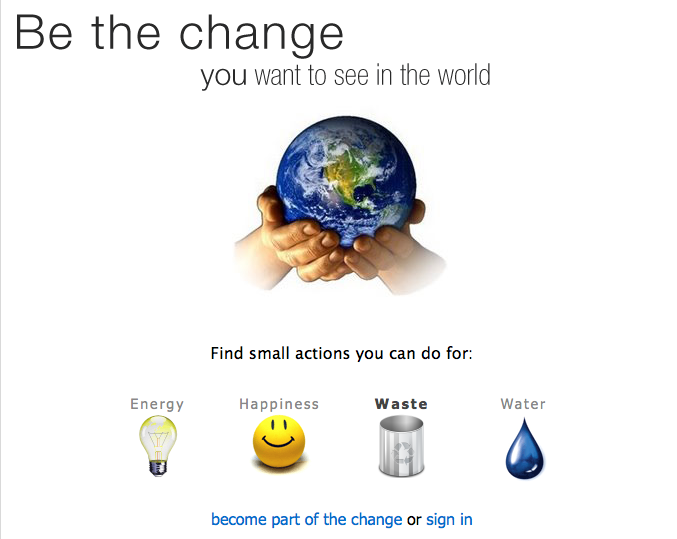 You enter the site and find tools to discover different projects to support and to share and raise awareness about your chosen action…all in all one very good, and simple, idea…informative site full of facts followed by tools to take what action you can, turning online visitors into cyberactivitists. Here is a sweet idea. DreamBank aims to help people 18 and over fund their dreams by posting them online and inviting friends and family to contribute toward their realization. Posting a dream is free, and dreams must simply be valued anywhere between CDN 20 and CDN 20,000—examples currently on the site range from paying off student loans to attending the 2010 Olympics. Donating toward a dream is an eco-friendly alternative to traditional gifts, the site says, noting the many unwanted items that typically get exchanged each year, or are never used. It also helps a charitable cause. When they post a dream, users of the site are asked to choose a charity they’d like to support, with options including CARE, Doctors without Borders, the African Wildlife Foundation and Kiva. DreamBank deducts CDN 2.25 in fees from loved ones’ contributions, and until the dream is realized, the rest gets pooled into one big fund, the interest on which is donated to the charity the user selected. Users of the site can connect and exchange ideas with other “dreamers,” and they can also withdraw their donated cash at any time, closing out their dream. DreamBank, meanwhile, deducts 2.5 percent of their total funds when they cash it out. 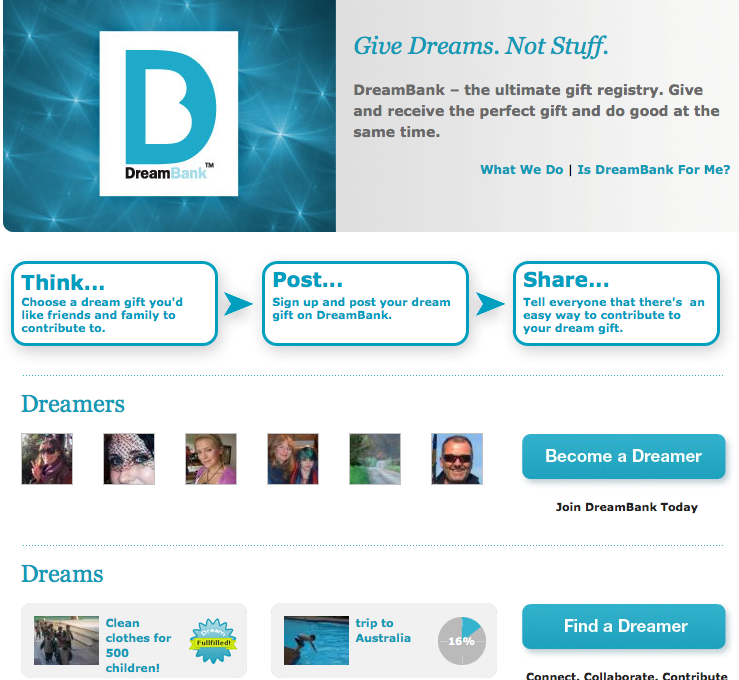 Launched earlier this month, DreamBank already has more than 30 dreams posted on the site. Financial partners working behind the scenes are PayPal and HSBC.